Ideal self catering weekend and holiday accommodation is offered in two beautifully restored and decorated guesthouses dating back to the early 1900's. The guesthouses are situated in peaceful farming surroundings in a valley of trees between the hills of the Kammanassie Mountains near Uniondale in the Klein Karoo of South Africa. Guests have a lovely view of the impressive peak of Mannetjiesberg, a beacon in the Uniondale area. During the winter the peak is covered in snow providing visitors a picturesque view. The farm offers a wide variety of activities such as various hiking routes and numerous trails that can be explored on foot. During the summer guests can swim in the farm dam surrounded by nature. Fresh water angling (bass fishing) is also possible. Bird and wildlife abounds. The hills of the Kammanassie Mountains are the home of the famous Cape Mountain Zebra and the lone leopard. Apart from the normal birdlife there are also a variety of birds of prey such as the Black Eagle. Other wildlife include duiker, Grysbuck, Klipspringer, Grey Rhehbuck, Kudu, Baboons, Lynx, Dassies, Mongoose, reptiles and amphibians. 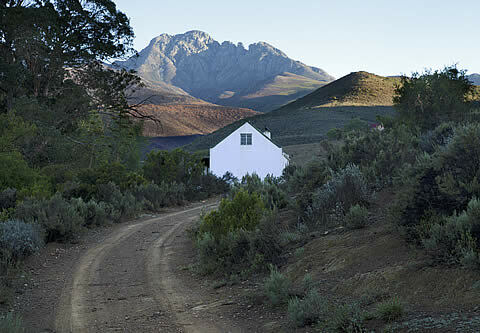 Rare mountain fynbos and scarce indigenous plants and insects can be found high up in the mountains. Experienced mountain climbers will find ample opportunities to test their skills and mountain bikers will enjoy the numerous farm tracks in the area. Lansrivier offers exceptional farm stays and is well worth a visit.